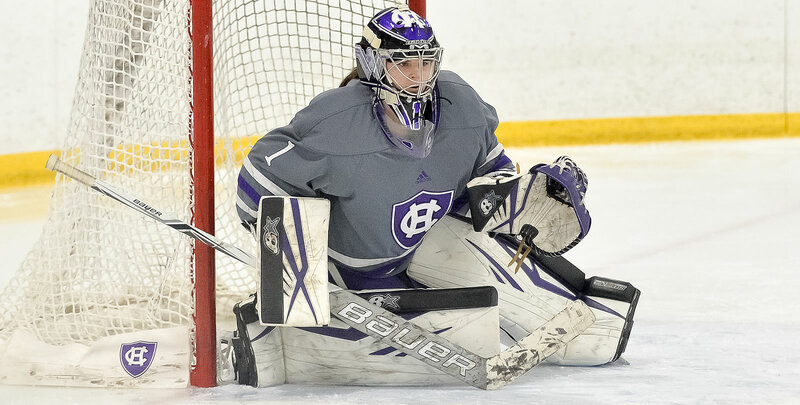 ROCHESTER, N.Y. - The Holy Cross women's ice hockey team dropped its season opener Friday night, 2-0, to RIT in New York. The Crusaders (0-1-0) allowed two first period goals to RIT's (1-0-0) Kendall Cornine and Madison Itagaki, but after that played even with the Tigers, even out shooting them in the final two periods, 15-14. 1-0 RIT (1st, 11:42, PP): After some nice passing around the perimeter of Holy Cross' defense, the Tigers' Ellie Larson and Mallory Rushton found Cornine up top who fired it home for the first goal of the season. 2-0 RIT (1st, 17:00, EV): There was a scrum in front of the Crusaders' goal and after sophomore goalie Julia Pelletier made a couple stops, the Tigers were able to bounce it out to Itagaki who took advantage and increased the home team's lead to 2-0. - RIT out shot Holy Cross, 27-25. - The Crusaders went 0-for-6 on power plays, while RIT went 1-for-5. - Pelletier made 25 saves as did RIT goalie Terra Lanteigne. - Holy Cross was called for five penalties to RIT's six. The Crusaders are back in action tomorrow afternoon at 1:00 p.m. in their second matchup with the Tigers.